Misty and I made a trip to Huntsville last night to see Cirque du Soleil's Saltimbanco at the Von Braun Center. As usual with Cirque du Soleil, the production has us mesmerized, but we were very surprised at how few people were in the arena. It looked like the place was only half filled. Before the show, we stopped by Bridge Street Town Centre to walk around a bit and have dinner. It's kind of like Birmingham's The Summitt, only the sidewalks run down the center with shops on either side -- truly an outdoor mall. 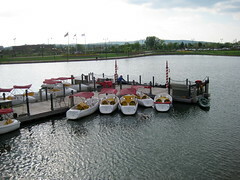 There's also water surrounding the area with paddle boats and gondolas -- it sounds weird, but it's really spiffy. We talked about coming back sometime with the girls -- if the boats didn't impress them, I'm sure the carousel would. The massive Monaco Pictures theater is something I'd like to explore further if I have a few hours for a movie. We ate dinner at Cantina Lardeo, recommended by a couple co-workers who live in the Huntsville area. It was really upscale compared to the usual Mexican fare, and we loved our food. It was easily the best Mexican food I'd ever eaten. I probably shouldn't have gone for an appetizer -- even though we shared it, the salad was enough for a meal. Our dessert -- a Mexican brownie, described as a "brownie with pecans on a sizzling skillet with Mexican Brandy Butter and vanilla or cinnamon ice cream" -- was devine. It was worth packing it into our already-full bellies. I wish we'd thought to snap a picture of it while the brandy was sizzling. As for Saltimbanco, you can read more about it in my review on my Get On With Your Nightlife blog on al.com. I don't think we'll ever tire of seeing new productions from Cirque du Soleil, and I'm anxious for another one to make its way to Alabama.